Lest you think I forgot… Some time ago I mentioned our first trip to the British Museum and the time we spent wandering the Egyptian exhibits. Believe it or not, the day was only half over at that point. My husband wanted to check out the early British history section, so that was our next stop. This area covered not only the tribal Britons, but many of the other European tribal peoples. I spent a lot of time looking at the swords and shields on display from various burial sights. Being a big fan of fantasy fiction, I’ve always had a fascination with the history of various weapons and how their manufacture was perfected. The swords and shields in this area were made of bronze. While the blades tend to be simple, the shields had interesting decoration. 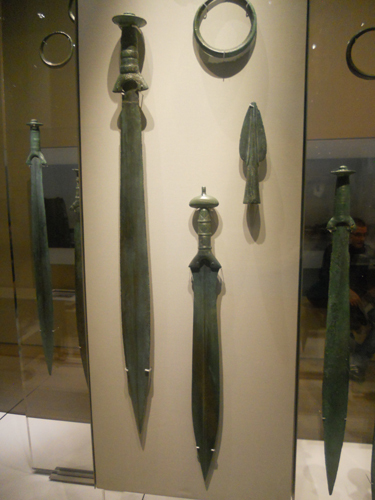 Many of these weapons were found buried beside their original bearers. 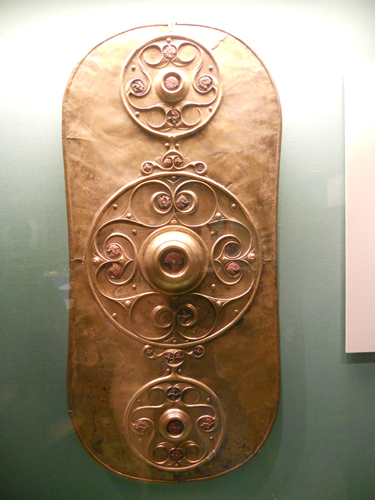 The most decorative shields seem to be discovered near rivers and some of them may have been offerings to the gods. Much of this section was devoted to the bronze work weapons and jewelry created by the various tribal peoples as well as their burial customs. It seems that burying men in a cart with their worldly goods was common practice for awhile (rather than constructing a coffin). The museum guide map includes a handy highlights section, for those who have to squeeze their visits into a day or two. 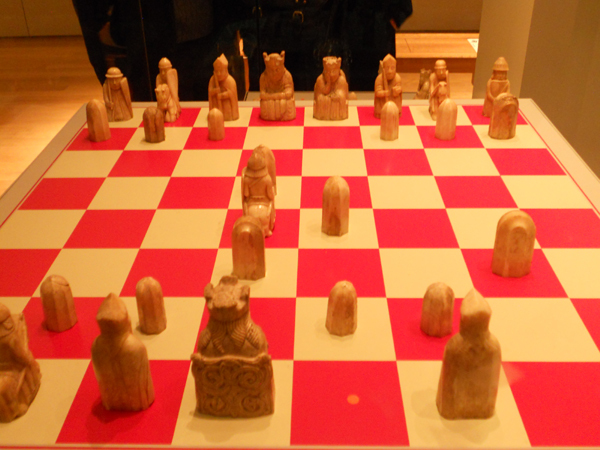 One of the suggested stops was the Lewis Chessman, one of the most famous chess sets in the world. 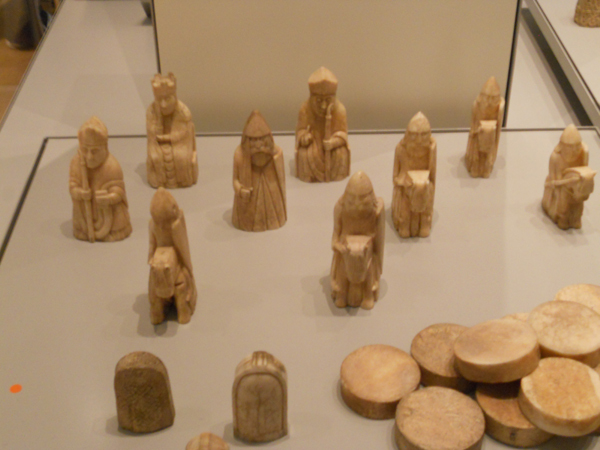 Discovered in 1831 on the Isle of Lewis in Scotland, the chess set consists of 93 pieces carved from walrus ivory. Eleven of the chessmen are on display at the National Museum of Scotland in Edinburgh, while the rest are housed at the British Museum. I only have a rudimentary knowledge of how chess is played, but I’ve always had a fascination with chess sets. I like to see how artists choose to represent the various pieces and tie it into their overall theme. Aside from the pawns, which are simple and plain, the Lewis chessmen are carved to resemble the people who held each piece’s various title (kings and knights and bishops and so on). Our last stop was to the clock exhibit. This turned out to be one of my favorites and I’m looking forward to going back. 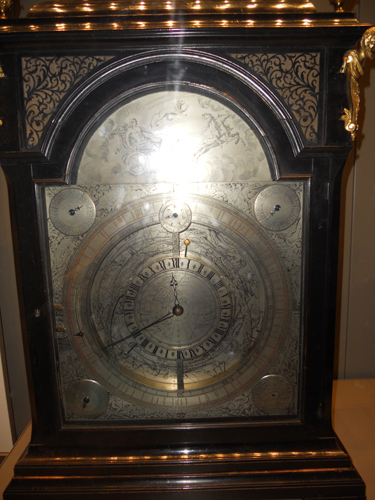 It starts with early clocks, explaining the mechanism that made the time pieces work. 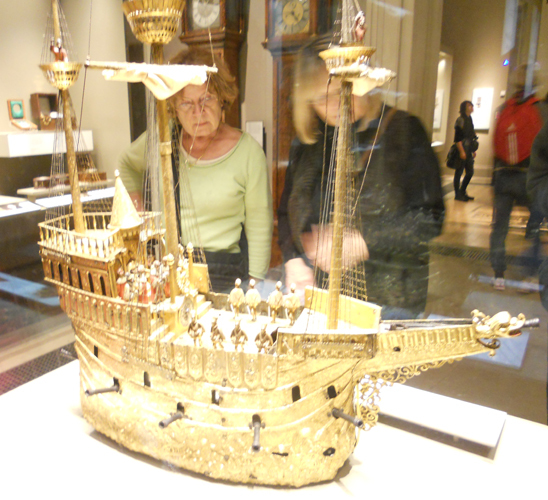 From there it covers clocks through the ages, including the time when clocks were elaborate works of art. There are tons of fabulous clocks on display. My favorite was this pirate ship which was designed to call people to feast. It would travel the length of the table and, when it reached the end, it would stop and fire its tiny cannons. Some of the clocks are so elaborate, people at the time feared they were possessed by demons or functioned via of dark magic. 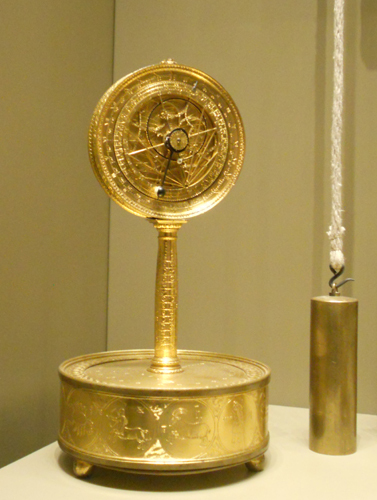 My favorites were the clocks that incorporated astrological maps and astrolabes. Tired, and with aching feet, we decided to leave the rest of the museum for another day. We headed out into the crisp London night only to discover how hard it is to find a place to eat when you haven’t made a reservation in advance. (But having lived in Toronto for eight years, we shouldn’t really have been surprised). Eventually we found a nice little Italian restaurant close to the train station and had a pleasant meal. It was great to see the city lit at night, something we’d been too tired to see on our first visit. 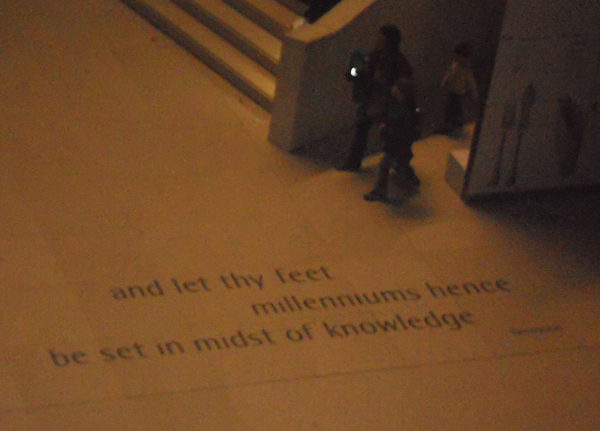 We’ve been to the British Museum twice since, and I’m looking forward to going back again. If we manage to spend a little time in each exhibit during our time here, we’ll consider ourselves lucky!